The Sixty-Nine Stations of the Kisokaido. Excellent impression with strong woodgrain; the black rock and tree glisten with mica to create the illusion of frost. Pristine colour. Small repaired wormage above print number seal and one lower right, otherwise very good condition. 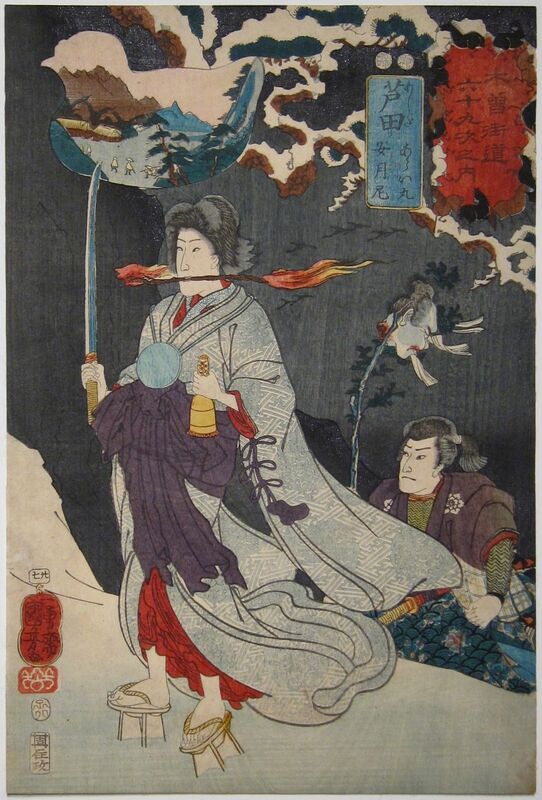 In the mountain snow of Ashida, the sorceress Takiyasha performs a magic ritual, clenching a torch between her teeth, a mirror around her neck and a sword in her right hand. 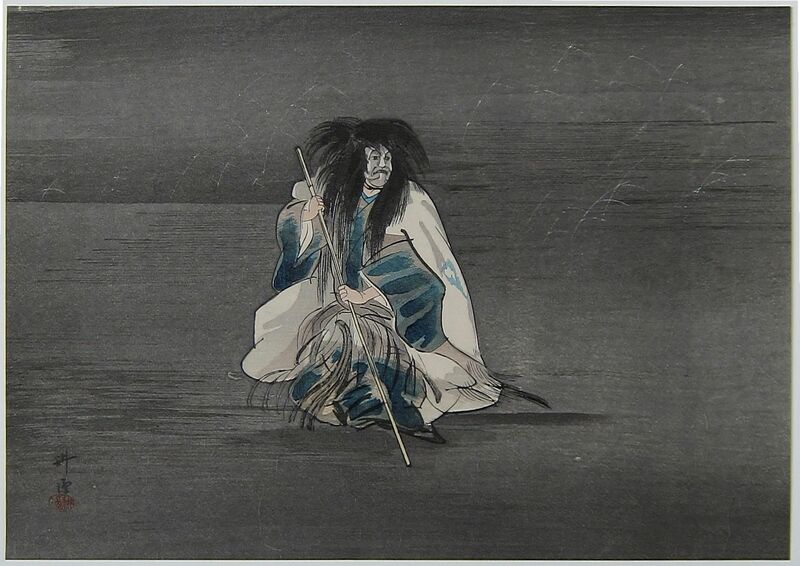 She is followed by her henchman Araimaru who brandishes the head of one of her victims on a stick. Her short hair belies her former vocation as a nun before she resorted to witchcraft. There are many puns on word and image in this print. The horses around the title cartouche pun Soma, the name of her ancestral home, and geta is a pivotal word for her high clogs and the station Ashida. The bird shape cartouche for the landscape is derived from the name Uto Yasukata, a loyal retainer killed by Takiyasha and her brother. Utoysukata is also the name of a bird in Northern Japan. 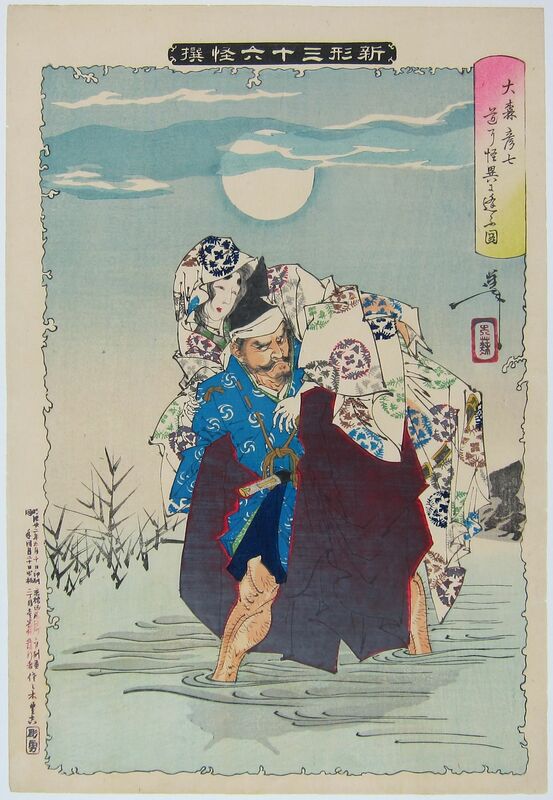 Signed Ichiyûsai Kuniyoshi ga. Censor seals Kinugasa, Murata, Rat 8. The Death Stone of Nasu Moor. 1891. Very good impression of the first edition. Good colour. Slight trimming, otherwise very good condition. 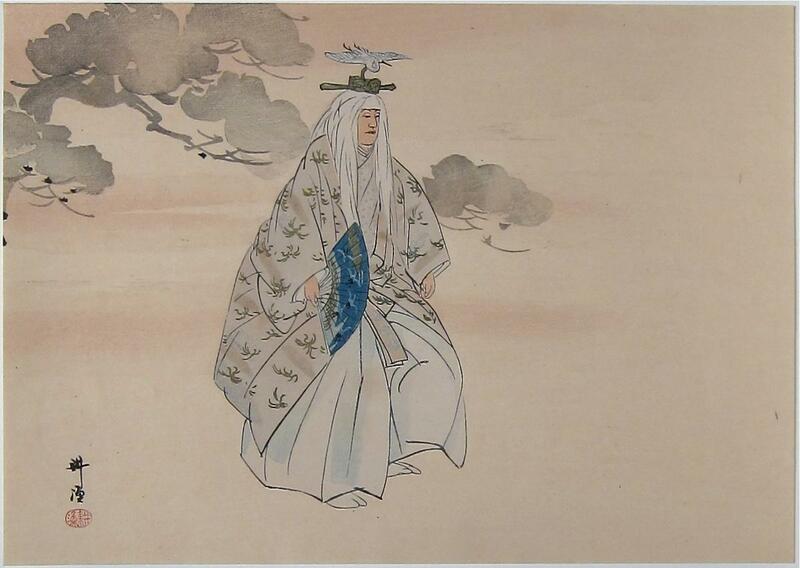 The emperor became ill after his favourite concubine, Tanamo no mae, bewitched him with black magic. When asked to approach the altar to pray for his recovery, she reveals her true nature as the nine tailed fox and scampers off to Nasu Moor. The emperor sends the master archer Kuranosuke in hot pursuit. She was shot and turned into the death stone known as sessho seki. Anyone who touched it or even looked at it would die. 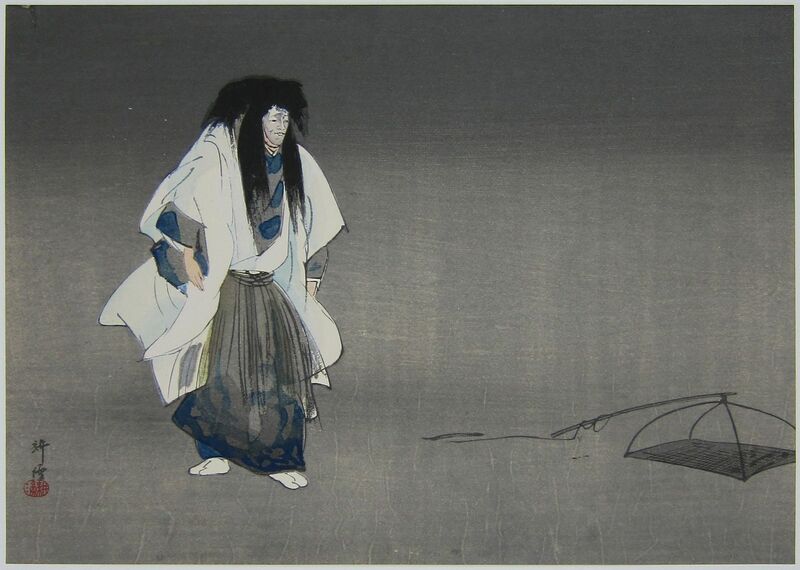 The ghost of Tanamo no mae appears here on the desolate moor before the death stone. 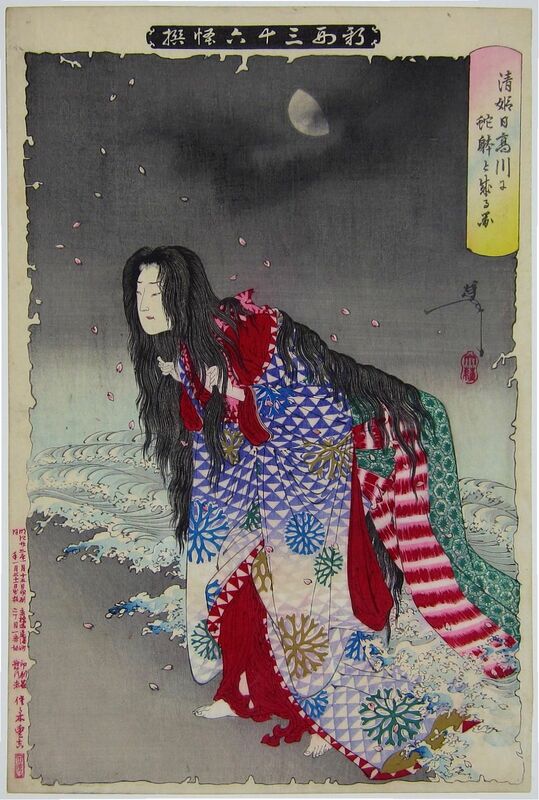 Her outermost garment is decorated with spider's webs and cherry blossom, a symbol of female entrapment and the rust orange undergarment belies her nature as the fox spirit. 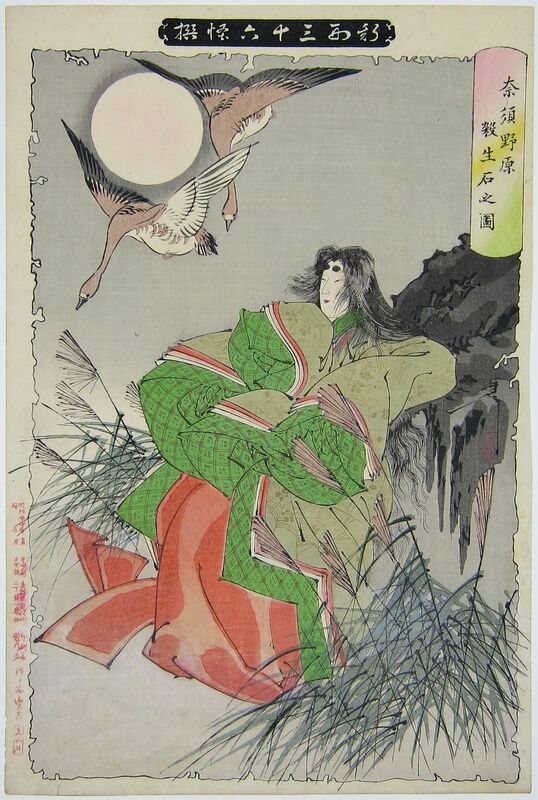 The two geese show that death is present and appear to be struggling in flight. Legend had it that birds would die when flying over the rock. Ref Plate 23. Page 128 Yoshitoshi's Strange Tales. John Stevenson, Hotei Publishing.